Botanically, a nut is a hard, indehiscent (not opening to discharge seeds), simple, dry fruit, whereby the plant's ovary wall becomes very hard (stony or woody) at maturity, and where the seed remains unattached or unfused with the ovary wall. Examples of such true nuts include acorns, chestnuts, hazelnuts, and pecans. However, the term nut also is used in less restrictive culinary terms to refer to any edible seed that is surrounded by a hard shell. While brazil nuts, peanuts, and almonds are called nuts in a culinary sense, they are really seeds, enclosed variously in capsules, legumes, and drupes. By either definition, nuts advance a plant's individual purpose of reproduction, while also providing a larger value for the ecosystem and for humans. Ecologically, they are a significant food source for wildlife. For humans, many nuts are edible and considered a good nutritional and energy source, whether used in cooking, eaten, raw, roasted, or press for oil. A fruit, in a botanical sense, is the ripened ovary—together with seeds—of a flowering plant. In flowering plants, an ovary is the part of the carpel that holds the ovule(s); after pollination, the ovary will grow into the fruit, while the ovule(s) become the seed(s). In many species, the fruit incorporates the ripened ovary and surrounding tissues. In other words, after an ovule is fertilized, the ovary begins to expand. The petals of the flower fall off and the ovule develops into a seed. The ovary eventually comes to form, along with other parts of the flower in many cases, a structure surrounding the seed or seeds that is the fruit. Fruit development continues until the seeds have matured. The wall of the fruit, developed from the ovary wall of the flower, is called the pericarp, which is often differentiated into two or three distinct layers called the exocarp (outer layer—also called epicarp), mesocarp (middle layer), and endocarp (inner layer). A nut in botany is a simple dry fruit with one seed (rarely two) in which the ovary wall becomes very hard (stony or woody) at maturity. The seed remains unattached or unfused with the ovary wall. (A caryopsis, typical of grains like wheat, rice, and corn, is a type of simple dry fruit that is indehiscent, but the pericarp is fused with the thin seed coat.) Most nuts come from pistils with inferior ovaries and all are indehiscent (not opening at maturity). 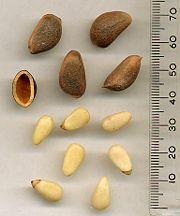 Nuts do not split on their own along a definite seam to release the seed. In summary, seeds are ripened ovules; fruits are the ripened ovularies or carpels that contain the seeds; and nuts are types of fruit (with seeds) and not another term for seeds. A nut is a compound ovary that is both the seed and the fruit. True nuts are produced, for example, by some plants—families of the order Fagales. A woman selling nuts at a roadside in Izmir Province, Turkey. A nut in cuisine is a much less restrictive category than a nut in botany, as the term is applied (or misapplied, depending upon the viewpoint) to many seeds that are not true nuts or to any hard fruit. Any large, oily kernel found within a shell and used in food may be regarded as a nut. For example, a brazil nut is really a seed enclosed in a capsule, the peanut is really a seed in a woody, indehiscent legume or pod, and the almond and cashew are really seeds enclosed in a drupe. A seed, such as a peanut, comes from fruit and can be removed from the fruit. A nut is both the seed and the fruit, which cannot be separated. For example, what appears to be the fruit of the cashew tree is an oval or pear-shaped accessory fruit or false fruit that develops from the receptacle of the cashew flower. Called the cashew apple (better known in Central America as "marañón"), it ripens into a yellow and/or red structure about five to 11 centimeters long. The term false fruit (pseudocarp, accessory fruit) is sometimes applied to a plant structure that resembles a fruit, but is not derived from a flower or flowers. The true fruit of the cashew tree is a kidney or boxing-glove shaped drupe that grows at the end of the pseudofruit. Within the true fruit is a single seed, the cashew nut. Although called a nut in the culinary sense, in the botanical sense, the fruit of the cashew is a seed. The true fruit, however, is classified as a nut by some botanists. Almond is the edible seed of a drupe – the leathery "flesh" is removed at harvest. Cashew nut is a seed. Coconut is a dry, fibrous drupe. Horse-chestnut is an inedible capsule. Macadamia nut is a creamy white kernel (Macadamia integrifolia). Peanut is a legume and a seed. Pistachio nut is the seed of a thin-shelled drupe. Because nuts generally have a high oil content, they are a highly prized food and energy source. A large number of seeds are edible by humans and used in cooking, eaten raw, sprouted, or roasted as a snack food, or pressed for oil that is used in cookery and cosmetics. Several epidemiological studies have revealed that people who consume nuts regularly are less likely to suffer from coronary heart disease. Recent clinical trials have found that consumption of various nuts such as almonds and walnuts can lower serum LDL cholesterol concentrations. Although nuts contain various substances thought to possess cardioprotective effects, scientists believe that their fatty acid profile is at least in part responsible for the hypolipidemic response observed in clinical trials. Nuts (or seeds generally) are also a significant source of nutrition for wildlife. This is particularly true in temperate climates where animals such as jays and squirrels store acorns and other nuts during the autumn to keep them from starving during the winter and early spring. Nuts, including both tree nuts and peanuts, are among the most common food allergens (FAAN 2007). The "nut" of the horse-chestnut (Aesculus hippocastanum), is also known as a conker. Conkers are inedible, due to the presence of the toxic glucoside aesculin, but are collected and used in an old children's game, also known as conkers, in which a nut is threaded onto a strong cord and then each child attempts to break their opponent's conker by hitting it with their own. A related species, Aesculus californica, was formerly eaten by the Native Americans of California in times of famine. It must be leached to remove the toxic constituents before eating. Adams, S. 2005. Nuts. Nutra-smart.net. Retrieved October 27, 2007. Food Allergy and Anapylaxis Network (FAAN). 2007. Common food allergens. The Food Allergy & Anaphylaxis Network. Retrieved June 24, 2007. Kellogg, J. H. 1920. The Itinerary of Breakfast. New York: Funk & Wagnalls Company. Micronutrient Information Center - Linus Pauling Institute. Nuts and their bioactive constituents: Effects on serum lipids and other factors that affect disease risk - American Journal of Clinical Nutrition. This page was last modified on 15 December 2018, at 16:31.